David Massey's varied career has taken him from teaching and music journalism to presenting, producing and writing for radio. As the Romanian revolution was ending, David led a team taking supplies to Bucharest and Timisoara. On the way home he stopped near Checkpoint Charlie to help chip holes in the Berlin Wall. Rather fittingly, David and his wife Debi now run Globehuggers Emergency Supplies - a business specializing in bespoke grab bags and emergency equipment. David's first novel, Torn was published in August 2012 by The Chicken House and went on to win Lancashire Book of the Year in 2013. 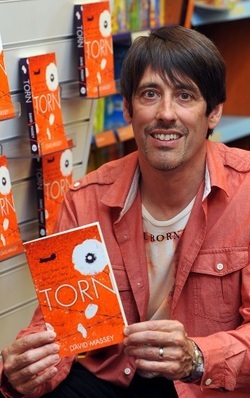 In its first full year of circulation, Torn was long-listed for the Branford Boase Award, and the Waterstone's Children's Book Prize. David's first novel has also been voted one of the most important books of 2014 in the USA by a group of twelve educators from the National Council for the Social Studies and has been nominated for the Georgia Peach awards. World Book Day March 2013 saw the release of David's second YA or Young-adult fiction novel, Taken in the UK which was long-listed for the Carnegie Medal.